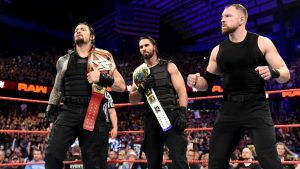 Raw Recap, 8/10/2018 – The Shield Receives a Disappointing Loss « Believe-In-Rollins.com | Your Most Dedicated Source for Seth Rollins! Ambrose did not seem to take the defeat well. While Reigns and Seth Rollins recuperated in the ring, The Lunatic Fringe — who reaffirmed his commitment to The Shield just days prior — rolled out from under the ropes and made his exit without so much as a glance toward his brothers, leaving them to wonder what they were seeing: Disappointment? Dissent? Or just dejection from a Superstar who felt he hadn’t pulled his weight? Only one man knows, and he isn’t talking.